A team of researchers from Caltech and Harvard has designed and created mechanical chains made of soft matter that can transmit signals across long distances. 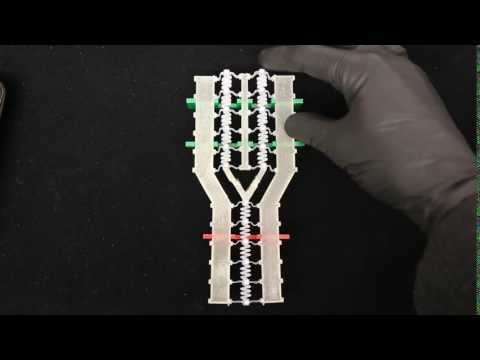 Because they are flexible, the circuits could be used in machines such as soft robots or lightweight aircraft constructed from pliable, nonmetallic materials. Unlike hard materials, which transit signals readily, soft materials tend to absorb energy as it passes through them. An analogy is hitting a firm punching bag versus a soft one: with the firm bag, the energy of your punch moves through the bag and sends it swinging, but the soft bag deforms your fist like a lump of dough and therefore will swing less. To overcome that response, Caltech's Dennis Kochmann, Chiara Daraio, and their colleagues created an unstable, "nonlinear" system. Their findings have appeared in three papers published over the past few months. "Engineers tend to shy away from instability. Instead, we take advantage of it," says Kochmann, assistant professor of aerospace in the Division of Engineering and Applied Sciences, and one of the lead researchers on the project. Stable, or "linear," systems are attractive to engineers because they are easy to model and predict. Take, for example, a spring: If you push on a spring, it will respond by pushing back with a force that is linearly proportional to how much force you apply. The response of a nonlinear system to that same push, by comparison, is not proportional, and can include sudden changes in the direction or amplitude of the responsive force. The nonlinear systems that Kochmann and his colleagues designed rely on bistable elements, or elements that can be stable in two distinct states. The bistable elements that the team developed consist of arches of an elastic material, each a few millimeters in size. The elements can be in either a convex or a concave position—and are stable in either configuration. However, if you push on the element in its convex position, it responds by pushing back against the direction of force until it snaps into a concave position, accompanied by a sudden release of energy in the opposite direction. "It's an elastic response, and then a snap-through," explains Daraio, professor of aeronautics and applied physics. Collaborating with Katia Bertoldi, Jennifer Lewis, and Jordan Raney of Harvard University, Kochmann, Daraio, and Caltech graduate student Neel Nadkarni designed chains of the bistable elements, connected to one another by springs. When one link "pops" from the concave to the convex state, its spring tugs at the link that is next downstream in the chain, popping it to a convex position as well. The signal travels unidirectionally down the chain. The energy released by the popping balances out any energy absorbed by the soft material, allowing the process to continue down the chain across long distances and at constant speed. "We were inspired by the physics of phase transformations. A phase transformation is a process where a switching occurs between two stable states of a system. It is governed by strongly nonlinear mathematical equations that are not very well understood," Nadkarni says. A proof-of-concept version of the design constructed from 3-D printed elements is described in a paper published August 8, 2016 in the Proceedings of the National Academy of Sciences. This paper was the third in the series of publications outlining the new concept for transmitting signals. It outlined how the design can be used to build mechanical AND and OR logic gates such as those used in computer processors. Logic gates are the building blocks of circuits, allowing signals to be processed. "These systems could be used as actuators to control robotic limbs, while passively performing simple logic decisions," Daraio says. Actuators use the transfer of energy to perform mechanical work, and in this case, the transfer of energy would occur via a mechanical rather than an electrical system. The first paper in the series was published in March in the journal Physical Review B, and it described Kochmann's theoretical, mathematical framework for the system. The second paper was published in Physical Review Letters in June, and it describes Daraio's first experimental model for the system. While springs can be employed between the bistable elements, the team also demonstrated in the Physical Review Letters paper how magnets could be used to connect the elements—potentially allowing the chain to be reset to its original position with a reversal of polarity. "Though there are many applications, the fundamental principles that we explore are most exciting to me," Kochmann says. "These nonlinear systems show very similar behavior to materials at the atomic scale but these are difficult to access experimentally or computationally. Now we have built a simple macroscale analogue that mimics how they behave." The PNAS paper is titled "Stable propogation of mechanical signals in soft media using stored elastic energy." The authors are Nadkarni, Daraio, and Kochmann of Caltech and Jordan Raney, Jennifer Lewis, and Katia Bertoldi of Harvard University. The work was funded by the National Science Foundation. A 3-D–printed logic gate with bistable elements linked together by springs to transmit signals.